Iasi, the town of the seven hillocks, is situated in the North – East of Romania, at 47 ˚ 10’ northern latitude and 27˚35’ eastern longitude. The seven mild hillocks on which is situated, gives Iasi a similar image of the town of Rome, the altitude varying between 40 m in Bahlui meadow and 407 in Paun hill. The city Iasi extends on a surface of 3770 ha, that is 6,8% from the surface of Iasi county. 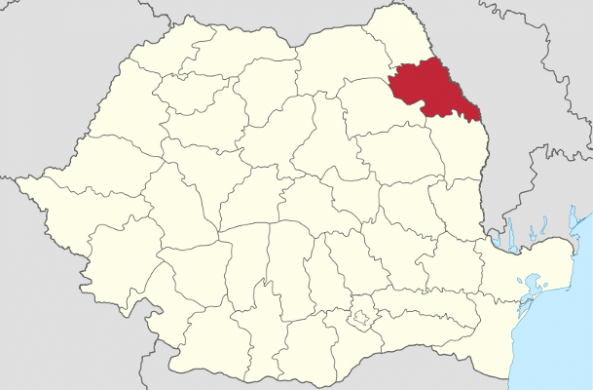 On the Romanian territory the neighbours are the counties : Botosani, Suceava, Neamt and Vaslui. With a surface of 5476 kmp, Iasi is a medium- sized town, representing 2,3 % of the country’s surface (being classed on the 23rd place amongst the other Romanian counties). The county’s relief is hilly. The central and northern part is dominated by hills and interfluvial plateaus , watered by the rivers Bahlui and Jijia , having mountainsides affected by the land slides and flooded meadows. The western side comprises hilly climaxes and high plateaus, (of over 400 m), having also meadows of the Siret and Moldova rivers.The southern side has has a high and massive relief(350- 450m), watered by the tributaries of the rivers Barlad and Vaslui. The hydrographical net is made up from rivers with variable sizes and ponds, resulted from the hidro-improving works, performed for avoiding the floods and for holding the water plus , necessary in the dry periods. The natural resources of the town are of local interest (sands, gravel, clays, mineral waters etc). The natural vegetation is specific to the forest- steppe, and the forest is represented by broad-leaved trees. The fauna includes species of cynegetical interest: the red goat, wild boars, wolves, foxes, rabbits, feathering birds. The land richness is represented by the 380 thousands ha of agricultural terrains, of which 66, 5% arable land; 28, 3% grasslands; 5,2 % wineries and orchards; the forests and other lands with forest – vegetation sum up to over 99 thousands ha, and the waters and the ponds, over 12 thousands ha. The stable population of Iaşi county, according to the Populations and housing census from 2011 (provisional data) was of 723.6 thousand inhabitants; 323.2 thousand inhabitants reside in the urban area (44.7%) while 400.4 thousand people live in the rural area (55. 3%). The climate is temperate and continental with eastern influences and a strong feature of continentalism. Iasi has a mild weather, temperate- continental, with hot summers and frosty winters, with weather variations between -36 C and + 40C, the annual average between 1901- 1991 being of + 9, 50C and precipitations of approximately 600 mm/ year.